Is there any logic to hunting down a grounding issue in a guitar? My JM Jaguar seems to have developed a really annoying buzz that I want to eradicate. Any ideas where I should start looking or is it just trial and error? I don't know much about Jaguar grounding but I would just try and connect the bridge or tailpiece to the control plate. The simplest looking way seems to be wrap a used guitar string around one of the bridge cups and run it to the control plate. You might have another issue but that will at least ground the bridge, strings and trem. Thanks James. You see, being a bit dim at this stuff, that is the last place I would have started (based on the fact that touching strings/bridge/tailpiece had no effect on the buzzing). I am no electrical wizard, clearly. Just hoping those cups are DEEP enough to get them grounded. 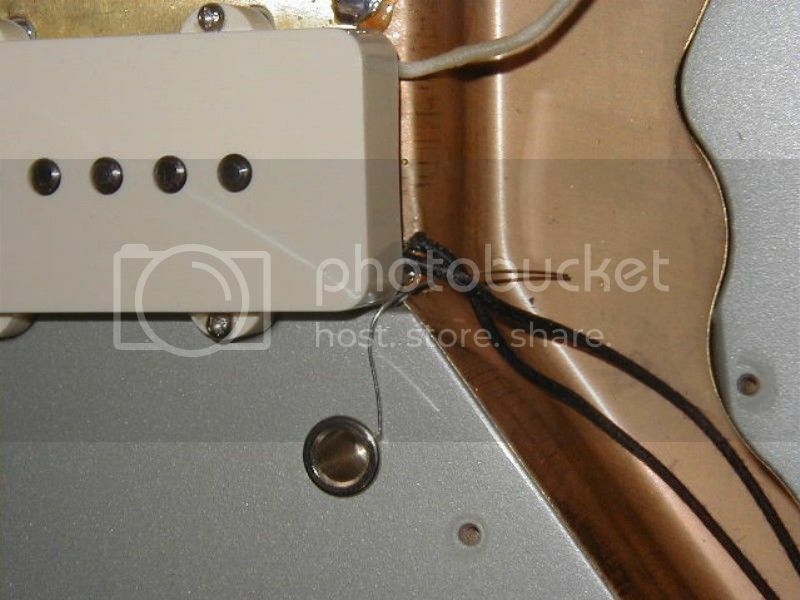 Looking at the wiring diagram of the Johnny Marr Jaguar, it should have a ground wire running from the reverb handle/tailpiece area that then connects to the brass shielding in the volume/tone control cavity. The diagram doesn't show any grounding from teh DEEP CUPS. Would this be needed if the tailpiece was grounded? If one of the controls has lost its ground, that at least should be easier for me to find and fix. Will need to get the screwdriver out. Nah, if the tailpiece is grounded it has the same effect, because the strings contact both bridge and tailpiece. I think the point is just to get the strings grounded somehow. Come to think of it, though, if the bridge is not grounded, the noise should get LOUDER when you touch the strings. The human body is more a source of interference than anything---think of how touching the tip of the guitar-end of a cable (while it's plugged into an amp but not a guitar) causes it to hum. Bit of a mystery here, then, but it stands to reason that something isn't grounded properly. I don't suppose you've changed anything in your setup? New pedals, new cables, even changed the location of the amp?